I joined Enertec in 1992 with the goal of learning computers to the lowest hardware and software level of understanding which included; compilers, interpretors, embedded software, hand-shaking, and real time communication with any form of signal, analog or digital. I quickly spun up on the complexities this company had to deal with in the infant CEMS industry; stringing laboratory grade analyzers to PLC's and recording data to PC's to produce reports submitted to State and Federal government agencys, themselves evolving with the continuing changes to the Clean Air Act in the U.S. The strength of this company came from a long involvement with PC's going back to the 70's when I first met Ric Whiffen, the proprietor, through one of his first employees, Craig Payne. His vision of Enertec propelled a group of engineers to solve many challenges using PC's; ultimately focusing on becoming a, if not the, leader in accurately interpreting the requirements of measuring pollutants 24/7. We called our software, "Sniffer". 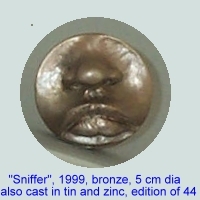 I interpreted this in a sculpture I call 'Sniffer', casting it many times in bronze, tin and zinc. The success of our efforts, sales going from 1 to 20 million a year during my employment, in my view, led to the purchase of the company by General Electric as 'best of breed'. Here is a proposal I made in 1996 to help define the software service department of the company. The company rushed to success with hard work, long hours and ever changing personnel, equipment, and workspace. Ric gave me an opportunity to learn and my 'people skills' allowed me to advance in this organization as it grew and I grew with it. At first every Project Engineer was responsible for every aspect of the projects themselves; customer contact, writing proposals, interpreting written promulgations into algorithms, integrating many different types and brands of analyzers, programmable logic controllers, and, of course, dealing with "Sniffer", the interface presented to the customer. The learning curve was so steep that few engineers survived the experiance for very long until the small company began organizing into managable roles. 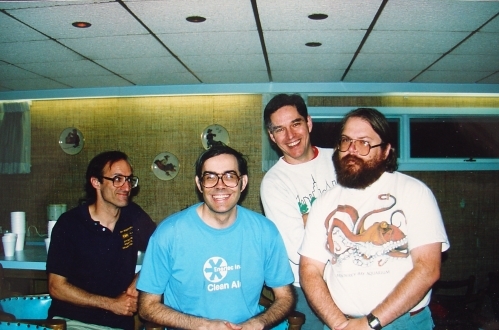 Here is a photo taken at my family house with Gimp, Ric, me & Craig a few years after they developed Pascal software for 8 bit microcomputers that would control the flight surfaces of USAF F-16 aircraft, the first 'fly by wire'. My interest in computing stemmed from my studies at Lehigh University. I had purchased, constructed and programmed my first computer in 1977 with Craig's expert help. I managed to produce programs on Technical Design Lab's, Xitan to price and compute complex engineering calculations of tubing for Precision Tube Company. I donated this early PC to the Computer History Museum. Here is a description of my activities with this computer.